January 4, 2010 - Burj Dubai, the world’s newest tallest building opened tonight with a stunning fireworks spectacle belying the structure’s dismal occupancy rate. 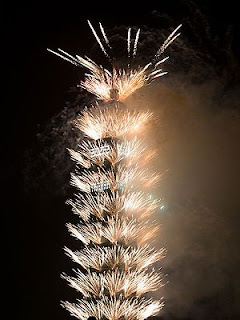 Ten thousand fireworks ascended the structure’s 2,717 foot spine, cascading in orgasmic bursts, falling to the 500-acre Downtown Burj Dubai on which the building sits. Nearly 900 high powered “stroboscope lights” lasered Dubai's tower, sending hypnotic pulses around the downtown area. Other displays featured a simulated “beating heart” created via 300 space canon projectors. Developer Emaar Properties' corporate logo was re-created, shooting the symbol’s iconic sun beams into the ink sky. The tower cost $1.5 billion U.S. to build, with the entire surrounding “Downtown Dubai” budget clocking in at $20 billion. The tower was recently re-named after Burj Khalifa, the ruler of United Arab Emirates' Abu Dhabi, which pumped $10 billion into the ailing emirate. Watch a video of the spectacle below.